Have Trunk Will Travel hire their elephants out for rides, as well as movies and advertising. Each weekend, elephants are trucked from Perris, California to the Santa Ana Zoo to give rides to visitors. It’s the same trainers and elephants that appear in our shocking video. Previous complaints about abusive training had been dismissed by zoo and city officials; now the evidence is irrefutible. ADI is working with a coalition of grassroots and national groups including Orange County People for Animals, Animal Protection and Rescue League, California Lobby for Animal Welfare and PETA to help end the rides. The new video evidence should convince the zoo director, the Santa Ana Mayor and City Council to halt the elephant rides. No decision has been made as we go to press; however the zoo director, Kent Yamaguchi, has said publicly that he would immediately end the rides if proof of abuse surfaces. He told ADI that the city and zoo are aware of video footage, he had viewed it, and they are investigating and taking the matter seriously. ADI Campaigns Director, Matt Rossell, recently addressed the Santa Ana City Council and presented them the footage of Tai and other elephants at Have Trunk Will Travel being hit with bullhooks and shocked during training sessions. He urged them to review the evidence and make the right decision to shut down these rides. ADI has approached Mayor Pulido and members of the city council for a meeting and we are awaiting a response. Please help us end the rides. 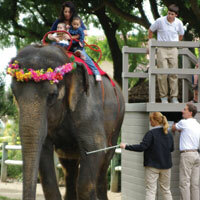 Contact the Santa Ana Zoo Director and Mayor today and politely ask them to immediately end the elephant rides.